I’ve been doing some thinking lately. It was sparked from a not-so-quiet yet still-so-sacred morning the other day – a typical every day for me now, on this side of our Jordan. Cartoons were on above the fireplace to entertain the big one, the bed was rocking in the corner to calm the little one. and I moved pen to paper to prayerfully-process through this recent shift in identity. 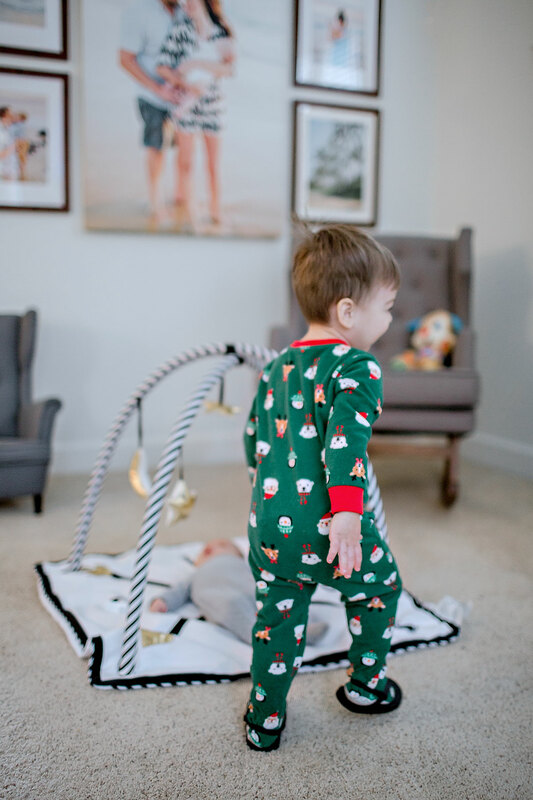 Being a stay-at-home mama is such a gift, I wrote, (though it feels an awful lot – pause to put summer-sandals on Santa-clad pajama-footie-feet – like sprinting through a never-ending obstacle course). The identity-transition from working-from-home to staying-at-home has brought a surprising anxiety along with it. For the last year, the second our big one’s head hit his naptime crib mattress, I sat down at my desk to work. And now that our little one is here, and I’m not working, I feel the daily naptime tension. The habitual muscle-memory of should-be creating, or writing, or doing something to contribute to our general bank account. I’ve been driven and chasing dreams and striving for success and building a business for over a decade, I prayed. How do I transition to simply being a mom And how do I do that transition well? Pause to pull a toddler-sized wingback a few inches to the left so the big one can climb up to reach the light switch. No sooner had the living room light flicked on than I suddenly saw it: I had years of building a career and an identity that was suddenly switched off, and an unfamiliar identity has been turned on in its place. The former? I was a woman invested in business while also in the throws of years-long delayed fertility, sitting at my morning-table with nothing but the sound of the ticking clock and scratching pen to fill the silence. The latter? I am a mother, investing into two little boys with the cartoons playing and the little one’s bed rhythmically-rocking and a regular morning-table interruption of the sweetest “Mom! Mom! Mama! Mama! Mama!” repetition. But how do I reconcile this tension? And turn off this naptime-need to do something when I’m already doing the very best thing? Pause to change the cartoon. Pause to swaddle the little one. When did I get to this point? I prayer-wondered. When did I arrive at this idea that something is only worth doing – it’s only valuable – if it comes with a paycheck? These every day, unpaid moments are the ones that have the most value. They are the ones with the most return on my investment. Pause to change the cartoon again. And I suddenly realize: I’m in the weaning-process. God is getting me accustomed to this new-normal that is away from the business-life I had grown especially fond of. He is moving me away from that world and its regular paychecks and all the pleasures and profits that went along with it. And He has put two babes in my arms, while teaching me to simply be quiet and easy in His. Later that day, I began thinking about that not-so-quiet quiet time. And I began to wonder how we decided to collectively call this daily time with God “quiet.” I mean, I understand the idea of the title, and embraced the quiet for years. But I’m afraid that there’s a whole slew of weary mama’s running their daily hamster-wheel routine with hardly a moment to themselves who have set aside their daily “quiet time” because this season of life just doesn’t allow for any quiet. Maybe we change the “quiet time” name to something less … quiet. We live in a world that looks down on screen-time-television for little ones. But I’m here to tell you: it’s ok to turn on the TV and tune out the noise for a few moments of interrupted-prayer and disjointed reading. Because somewhere along the lines of the last two years, I learned how to carry on a conversation with a girlfriend while a little one vyed for my attention. I’m learning to do the same with God. And I’m also learning that it can be just as rich as those “quiet times” He and I shared before, on that side of our Jordan.